Tony is an acupuncturist, speaker and mental health campaigner. Following an early career as a full-time figure skater, Tony joined the Metropolitan Police, serving the people of London in various roles for nearly twenty years before deciding to become a healthcare professional. He undertook three years of study for an acupuncture degree at the Northern College of Acupuncture, graduating with 1st class honours. 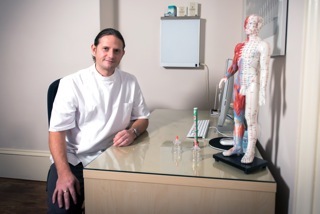 He currently operates acupuncture clinics in Cambridgeshire where he see’s patients for a wide range of physical and emotional health complaints. He is also a strong voice on behalf of the traditional acupuncture profession having held directorships of both the British Acupuncture Council and the British Acupuncture Accreditation Committee. Tony is also a passionate mental health campaigner. In 2017 he founded Ely based charity Talking FreEly which he now runs as CEO. This work promotes a better understanding and acceptance of mental illness through everyday conversation which includes holding public events, visiting schools and “popping up” wherever there is an opportunity to start a conversation. Tony has also spoken publicly about his own struggles and the challenges of changing mindsets around mental illness. Outside of work tony is kept busy with a large family. He enjoys spending time with his children and also studying Karate where he hopes to fulfil a lifelong dream by achieving his black belt in the next few months.